In other words, the U.S. economy relies on individual consumption to sustain the economic recovery but doesn’t pay most Americans enough to cover their expenditures without going into debt. What that means, of course, is that in 2017 many Americans—71 million (or 31.6 percent of adults with credit records), according to the Urban Institute—had debt in collections, thus putting their financial futures at risk. They have high average debt, are often paying off children’s educations and are dipping into savings to care for aging parents. Their paltry 401(k) retirement funds will bring in a median income of under $8,000 a year for a household of two. In total, more than 40% of households headed by people aged 55 through 70 lack sufficient resources to maintain their living standard in retirement. . .That is around 15 million American households. Finally, it means that the United States is heading for a level of income inequality that hasn’t been seen since 1928. Already, the richest residents in fives states and 30 cities have surpassed that threshold. Income inequality has risen in every state since the 1970s and, in most states, it has grown in the post–Great Recession era. From 2009 to 2015, the incomes of the top 1 percent grew faster than the incomes of the bottom 99 percent in 43 states and the District of Columbia. The top 1 percent captured half or more of all income growth in nine states. In 2015, a family in the top 1 percent nationally received, on average, 26.3 times as much income as a family in the bottom 99 percent. 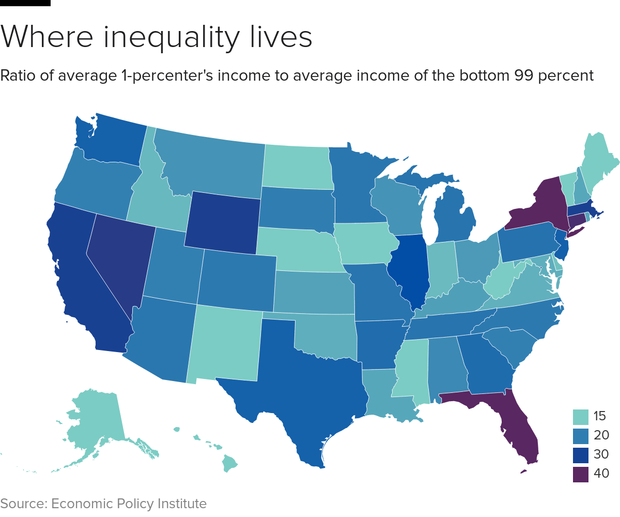 In the most unequal states—New York, Florida, and Connecticut—the top 1 percent had average incomes more than 35 times those of the bottom 99 percent! Merle Travis had it right. But these days, the iconic American worker isn’t loading sixteen tons of number nine coal—although they may be packing and shipping the equivalent in Amazon goods. Nor do they owe their soul to the company store—just to the employers who pay them so little and the sellers (of housing, cars and trucks, their children’s education, and healthcare) whose prices keep rising. As a result, most Americans are either just getting by or finding themselves deeper in debt, falling further and further behind the tiny group at the top. All the while they, like their coal-mining predecessors, are imploring St. Peter not to call them ’cause they just can’t go. *The top 40 percent of earners usually drive U.S. consumption growth. 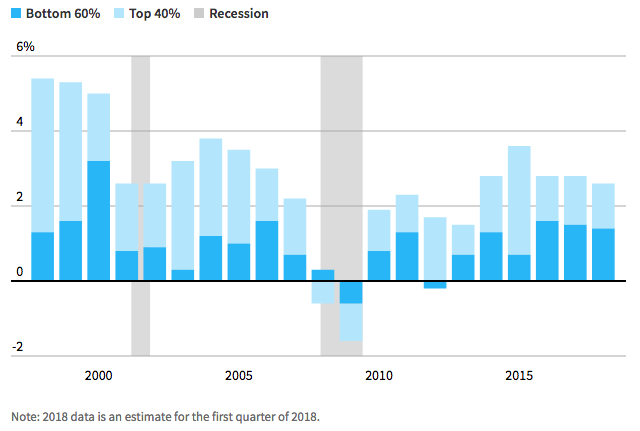 But 2016-17 was the first two-year span in at least two decades that the bottom 60 percent accounted for about half of the growth in consumption, and that appears to have continued in the first quarter of 2018. 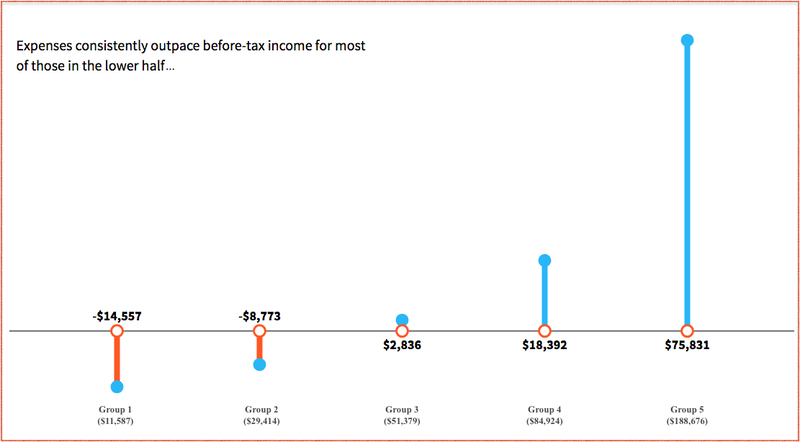 **The Reuters study divides Americans into five groups based on their median before-tax income, as illustrated in the chart at the top of the post. 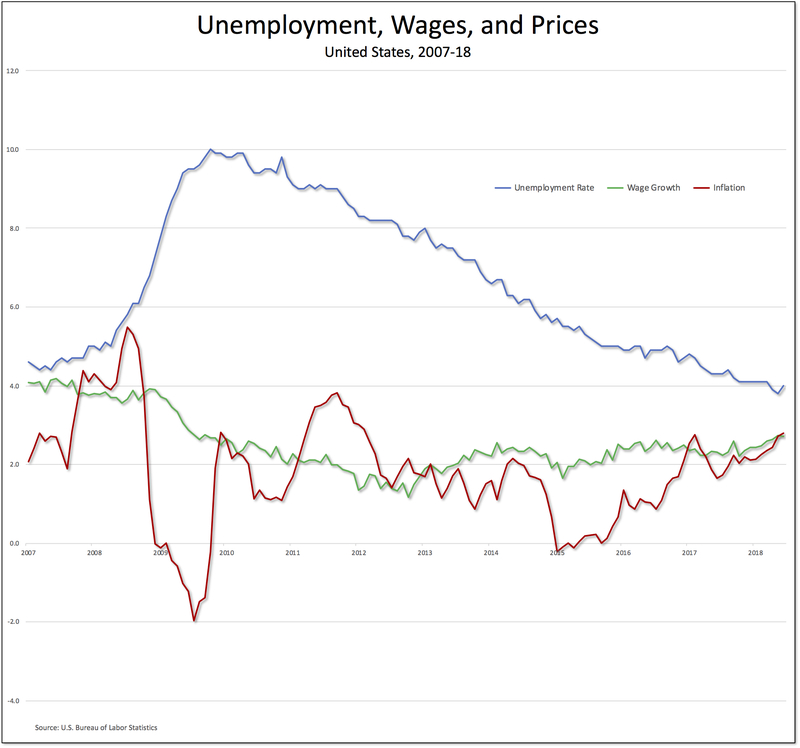 ***Even as the official unemployment rate (the blue line in the chart below) has plummeted, workers’ wages (the green line, for production and nonsupervisory workers) have barely stayed ahead of inflation (the red line, for the Consumer Price Index) in recent years. So cogently integrated with substantial supporting evidence, David! You’ve provided a classic encapsulation that should be very widely circulated and acted upon. Many years ago, when I was a libertarian, I believed American labor unions were typically ruinous. But upon their since being crushed, our society has very sorely lacked the countervailing power between economic factions that John K. Galbraith, Sr. so rightly propounded. 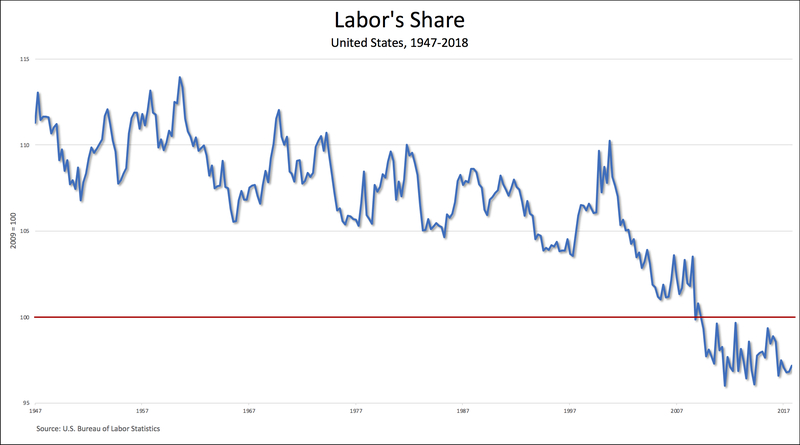 And besides reviving labor unions, individual workers should muster the courage to negotiate for their better compensation plus higher taxing of the rich. Despite full, though inadequately compensating employment, many people I know remain intimidated these days to try for more, due to actually baseless fear. But they should be far bolder, braver, and press hard! David, economics has long shown that individuals take their most appealing present choice–de facto, because only one in mental disarray would consciously do otherwise. What that choice is, however, makes for the borrowing-spending issue. Here in Germany, with its very painful recent history, it seems to be easy to go to the local shopping mall for an ice cream & some light shopping, rather than plan for an expensive dinner out or a weekend trip. I see this the three times a week I check out the situation. Until I departed the US this would never have been the case, as credit made for weekend trips to Las Vegas or San Diego, and in between a great feed at one of the Western-themed restaurants. This was also well practiced by yours truly.. Literally thousands of ancient and modern analyses, thesis and synthesis exist on these very topics globally. For a relatively modern and easy factual account in plain English, please read a small pamphlet by the Low Pay Unit entitled ” WAITING FOR CHANGE?” – Working in hotel and catering, for an analysis of globalisation and what it has meant for everyone. “The Government has a direct concern with the industry’s great potential for Growth, Job Creation and Enterprise…we need to encourage the strong point of our economy, many of them in the service sectors” (Cabinet Office, 1985″. “…One of greatest industries…with increased leisure, higher incomes, and early retirement, tourism in the next decade will be of the greatest growth industries” (R.H. Margaret Thatcher, MP, September 1983). “Jobs in tourism are already three times the number found in the car industry… But we have hardly yet begun to reap the benefits on offer. In the long run the industry could be as important in economic terms as North Sea Oil…The tourism and leisure industries are wide open for people with flair and determination…” (Norman Lamont MP, now minister of State for Defence, January 1984″. What has been dished out in these “fantastic growth sectors” is increasingly even lower paid jobs, more vulnerability and degradation to an increasingly more skilled and educated migrant workforce, ununionised, forced to leave their families and homelands because of poverty and everything else that I have alerted we us in other comments. I suggest that all above and similar masters take a very long holiday around the globe for a relaxing time in starving countries, or countries on the verge of it, or at least out of the charity of their fat bellies, treat the poor immigrants, or the warring parties, or those left on the way or some side of some border for a refreshing cool drink to quench their insatiable greed. We need to problematise and teach. Is the inescapable inference that we are teetering on the edge of the Mother of all Crashes. Thursday the BoE raised its base interest rate by .25% to .75% – shock horror – much press reaction. The ‘recovery’ is sustained by pretend monetarism and is very vulnerable to external losses of confidence in the money and stock markets plus as yet unexposed financial wizardry! And yet there is nothing — no mention whatever — regarding the actual cause of the problem: privilege, defined as legal entitlement to benefit from the uncompensated abrogation of others’ rights. The reason is simple: in modern mainstream neoclassical economics, there is no such thing as privilege. It cannot even be identified. 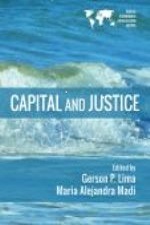 There is no word in the neoclassical lexicon for it, because the founding principle of the discipline is JB Clark’s dictum that all legally obtained wealth is by definition earned by commensurate contributions to production. When a private commercial bank exercises its privilege to issue money in order to charge interest on it, the interest is EARNED by the act of issuing money and “managing risk” — and never mind that bankers who exercise the privilege of money creation have always failed utterly at managing its risk. When the holder of a drug patent profits by preventing others from producing the drug to sell at a lower price, he EARNS his return — presumably by killing the people who could have survived if they had been able to afford the drug. 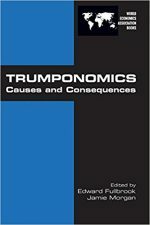 When government (at taxpayer expense) provides desirable services and infrastructure that landowners are legally entitled to charge everyone else full market value for access to, the landowners somehow EARN the resulting increase in rents and land value — even though that increased rent and value would be exactly the same if the landowner and all previous landowners had never existed. That is the insanity, the Big Lie, that neoclassical “economics” is based on. Roy, good points. As an American I was always impressed how some European nations became “royals” due to a distant ancestor who was the CEO’s mistress or military guard. That said, the law which the British beautifully developed to give equality to their free men allowed those free men to do most anything to include cheating in business. Note that the Muslims have long forbidden the outright lending of money at interest. You think things are bad now. Wait until the Republicans use their filibuster-proof majority in the Senate, which “The Map” of seats up for re-election in November says they will get, or if Mitch McConnell unilaterally abolishes the filibuster for all legislation, the way he did for judicial appointments, to replace the progressive income tax with a flat tax or even a national sales tax. The poor and working classes will really suffer then. Anthonyfromstatenisland, then we all work mostly for ourselves, declaring all expenses & hardly any income, just like big business despite their accountants. Have a garden, rifle & fishing rod for food. Get off the electrical grid as much as possible. Etc.